Have any love to spare? These bundles need it. Remember when I made those strawberry lemonade cupcakes? The cupcakes that I treated like dirt? The cupcakes that I felt were undeserving of my love? And my chew? The cupcakes that I just wasn’t into? These came out of my kitchen that same day. Weeks ago. Days ago. 850 years ago. What decade is it? I must not have been feeling the kitchen that day. Sometimes I love it, other days I loathe it. Some days my breads rise, my cupcakes fluff and my chicken caramelizes. Others my cake sinks, my garlic bread burns, my steak tastes like rubber and my broccoli… well, my broccoli dies. In the crisper drawer. Like always. No idea what was going on that day. I baked. Things worked. I ate. Lots. I walked 6 miles. Developed the worst blisters I’ve ever had in my life. Consoled myself with ice cream. Watched Father of the Bride. Twice. Ate bacon. Bacon! How can a day with bacon be… blah?! Weeks ago, a lovely reader named Laura sent me this recipe. Hi Laura! For some odd reason… she thought this had my name all over it. I have no idea why. Bacon. Butter. Bacon. Butter. Made them. Loved them! Adapted the recipe just slightly. Fresh green beans. Less butter. More broiling. Took weeeeeks to share them with you. Maybe because they sort of look like spiders? That’s got to be what you’re thinking. Right? I know it is. Because I know you. Me and you? We’re likethis. Which means you will love these. 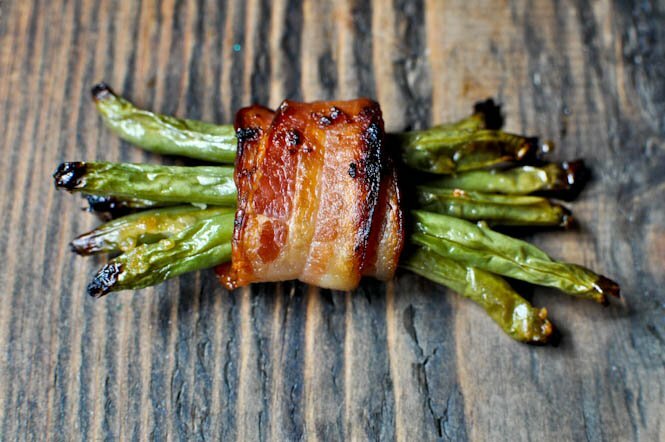 They are green bean fries meets crispy bacon meets brown sugar garlic bath. Don’t say no. Wash and thoroughly dry green beans, then season with salt and pepper. 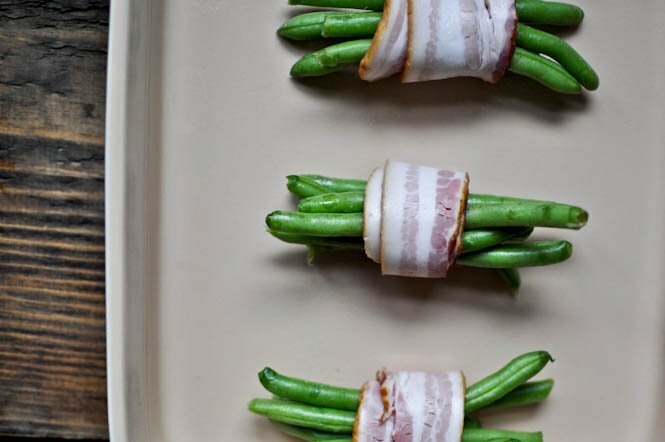 Bundle together about 5-8 green beans – this will depend on your size of beans and the amount of beans you get for one pound. Bundle together as many as you’d like! 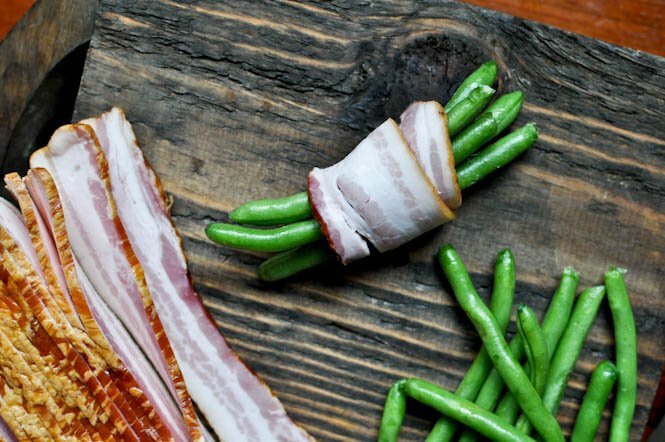 Using a slice of bacon, wrap it around the center of the beans to hold it together. Lay the bundle bacon seam side down in the baking dish to hold it together. Repeat with remaining beans. Heat a small saucepan over low heat. Add butter, brown sugar and garlic and whisk until melted and combined. 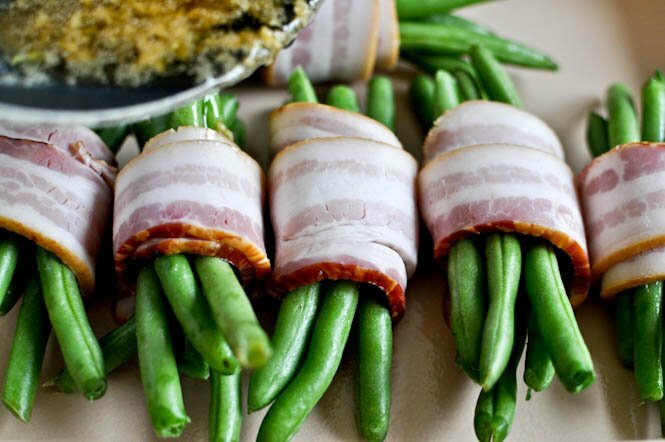 Using a pastry brush, brush the mixture over top of each green bean bundle. Cover the bundles with foil and bake for 35 minutes. Remove foil and bake for 10-15 minutes more, just until bacon gets crispy.